You'll explore the less-touristy side of things at Speed Boats Tours and McPrice Myers Winery. Take a break from the city and head to Moonstone Beach and Elephant Seal Rookery. Explore Paso Robles' surroundings by going to Hearst Castle (in San Simeon) and Mission San Antonio de Padua (in Jolon). It doesn't end there: do a tasting at Whalebone Vineyard. To see maps, ratings, reviews, and more tourist information, read Paso Robles online tour itinerary planner . Melbourne, Australia to Paso Robles is an approximately 23-hour combination of flight and bus. You can also do a combination of flight and train. The time zone changes from Australian Eastern Standard Time (Victoria) (AEST) to Pacific Standard Time (PST), which is usually a -18 hour difference. Traveling from Melbourne in January, expect nights in Paso Robles to be colder, around 3°C, while days are a bit cooler, around 20°C. Wrap up your sightseeing on the 4th (Sat) to allow time to drive to Las Vegas. Discover out-of-the-way places like Escape Adventures and Las Vegas Cyclery and McCullough Hills Trail. The Neon Museum and The Mob Museum are good opportunities to explore the local culture. Change things up with a short trip to Valley of Fire State Park in Overton (about 1h 10 min away). There's more to do: try to win big at Wynn Las Vegas. To see reviews, more things to do, maps, and other tourist information, use the Las Vegas online vacation planner . You can drive from Paso Robles to Las Vegas in 7 hours. Alternatively, you can do a combination of bus and flight; or do a combination of train and flight. In January in Las Vegas, expect temperatures between 17°C during the day and 5°C at night. Finish your sightseeing early on the 7th (Tue) to allow enough time to drive to Sedona. Get some historical perspective at Chapel of the Holy dove and Walnut Canyon National Monument. Get in touch with nature at Brin's Mesa Trail and Nature & Wildlife Tours. And it doesn't end there: look for gifts at Absolute Bikes, explore the striking landscape at Bell Rock, take a memorable drive along Red Rock Scenic Byway (SR 179), and explore the stunning scenery at Oak Creek Canyon. To see other places to visit, traveler tips, photos, and other tourist information, read Sedona itinerary planner . You can drive from Las Vegas to Sedona in 5.5 hours. Other options are to do a combination of flight and taxi; or do a combination of flight and shuttle. You'll lose 1 hour traveling from Las Vegas to Sedona due to the time zone difference. When traveling from Las Vegas in January, plan for a bit cooler days in Sedona, with highs around 14°C, while nights are about the same with lows around 3°C. Finish your sightseeing early on the 11th (Sat) to allow enough time to travel to Denver. On the 12th (Sun), take in the awesome beauty at Mount Evans. To find more things to do, maps, and tourist information, you can read our Denver trip maker app . Traveling by combination of taxi and flight from Sedona to Denver takes 3.5 hours. Alternatively, you can fly; or drive. Plan for a bit cooler temperatures traveling from Sedona in January, with highs in Denver at 7°C and lows at -7°C. Wrap up your sightseeing on the 12th (Sun) early enough to travel to New Orleans. Step out of the city life by going to Tammany Trace and Fairview-Riverside State Park. Your cultural itinerary includes sights like St. Joseph Plantation and Laura Plantation: Louisiana's Creole Heritage Site. Step out of New Orleans to go to Vacherie and see Oak Alley Plantation, which is approximately 1 hour away. There's much more to do: admire the striking features of St. Joseph Church and Gardens, take in the spiritual surroundings of St. Louis Cathedral, wander the streets of Garden District, and see the interesting displays at Blaine Kern's Mardi Gras World. For ratings, traveler tips, reviews, and more tourist information, go to the New Orleans trip planner . Fly from Denver to New Orleans in 5.5 hours. Alternatively, you can do a combination of bus and flight; or drive. Due to the time zone difference, you'll lose 1 hour traveling from Denver to New Orleans. When traveling from Denver in January, plan for a bit warmer days in New Orleans, with highs around 17°C, while nights are much warmer with lows around 12°C. Wrap up your sightseeing on the 15th (Wed) early enough to travel to Key West. Do some cultural sightseeing at Key West Cemetery and Key West Lighthouse and Keeper's Quarters Museum. Your inner history buff will appreciate Truman Little White House and Fort Zachary Taylor. Spend the 17th (Fri) exploring nature at Dry Tortugas National Park. And it doesn't end there: find your balance on the water with some of the best stand-up paddleboarding in the area, admire all the interesting features of The Overseas Highway, take a tour by water with Boat Tours & Water Sports, and take a memorable tour with Tours. To see more things to do, other places to visit, traveler tips, and more tourist information, read Key West attractions app . Getting from New Orleans to Key West by flight takes about 6.5 hours. Other options: do a combination of flight and shuttle; or drive. The time zone changes from Central Standard Time (CST) to Eastern Standard Time (EST), which is usually a 1 hour difference. Traveling from New Orleans in January, expect Key West to be somewhat warmer, temps between 28°C and 22°C. Finish your sightseeing early on the 19th (Sun) to allow enough time to take a bus to Marathon. 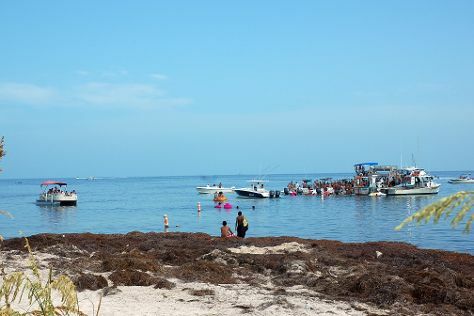 Visit Sunset Park Beach and Sombrero Beach for some beach relaxation. Explore hidden gems such as A Lil' Tail Charters and Islamorada Beer Company Brewery and Tasting Room. When in Marathon, make a side trip to see Fishing Charters & Tours in Islamorada, approximately 38 minutes away. The adventure continues: look for all kinds of wild species at Dolphin Research Center and enjoy the sand and surf at Bahia Honda State Park. To see photos, where to stay, ratings, and tourist information, refer to the Marathon tour planner. Traveling by bus from Key West to Marathon takes 1.5 hours. Alternatively, you can drive. Expect a daytime high around 29°C in January, and nighttime lows around 22°C. Finish your sightseeing early on the 22nd (Wed) to allow enough time to drive to Miami. Take a break from the city and head to Everglades National Park and Fort Lauderdale Beach. Get some cultural insight at Art Deco Historic District and Vizcaya Museum and Gardens. Change things up with a short trip to Nature & Wildlife Tours in Ochopee (about 1h 25 min away). To find more things to do, ratings, where to stay, and other tourist information, read our Miami trip itinerary builder app . You can drive from Marathon to Miami in 2.5 hours. Other options are to take a bus; or do a combination of bus and flight. In January in Miami, expect temperatures between 29°C during the day and 20°C at night. Wrap up your sightseeing on the 25th (Sat) early enough to drive to Orlando. Escape the urban bustle at Cocoa Beach and Beach at Daytona Beach. Do some cultural sightseeing at Stetson Mansion and Ponce de Leon Inlet Lighthouse & Museum. There's more to do: revel in the low prices at Orlando International Premium Outlets. To see maps, reviews, traveler tips, and other tourist information, use the Orlando trip itinerary builder tool . Traveling by car from Miami to Orlando takes 4 hours. Alternatively, you can take a bus; or take a train. In January, Orlando is little chillier than Miami - with highs of 25°C and lows of 13°C. Finish up your sightseeing early on the 28th (Tue) so you can travel to Niagara Falls. Satisfy your inner culture vulture at 21 Brix Winery and Liberty Vineyards Winery. You'll explore the less-touristy side of things at HoliMont and Lana's The Little House. Next up on the itinerary: admire the sheer force of Niagara Falls. You can plan Niagara Falls trip in no time by asking Inspirock to help create your itinerary. Fly from Orlando to Niagara Falls in 5.5 hours. Alternatively, you can drive; or take a train. Expect colder temperatures when traveling from Orlando in January; daily highs in Niagara Falls reach 0°C and lows reach -9°C. Finish your sightseeing early on the 31st (Fri) to allow enough time to travel to Boston. Get a sense of the local culture at Pickety Place and North End. Get in touch with nature at Windblown Cross Country Skiing and Snowshoeing and North Hampton State Beach. There's more to do: explore the world behind art at Museum of Fine Arts. For reviews, ratings, traveler tips, and more tourist information, you can read our Boston travel route planner . Traveling by combination of bus and flight from Niagara Falls to Boston takes 5.5 hours. Alternatively, you can do a combination of train and flight; or drive. Prepare for somewhat warmer weather when traveling from Niagara Falls in February: high temperatures in Boston hover around 4°C and lows are around -5°C. Wrap up your sightseeing on the 3rd (Mon) early enough to travel to Washington DC. 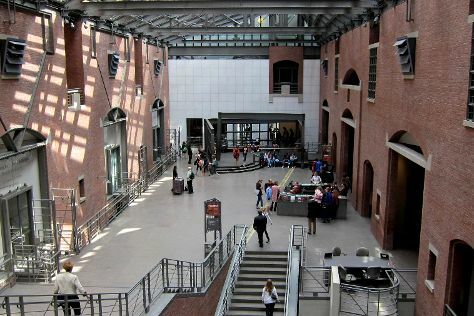 Kick off your visit on the 4th (Tue): take an in-depth tour of United States Holocaust Memorial Museum, then contemplate the long history of Arlington National Cemetery, and then learn more about the world around you at Smithsonian National Museum of Natural History. On the 5th (Wed), you'll have a packed day of sightseeing: pause for some serene contemplation at Saint Ignatius Church, steep yourself in history at Historic Port Tobacco Village, and then get engrossed in the history at Newseum. To see maps and more tourist information, refer to the Washington DC itinerary planner . Fly from Boston to Washington DC in 3 hours. Alternatively, you can do a combination of flight and train; or drive. Traveling from Boston in February, things will get somewhat warmer in Washington DC: highs are around 10°C and lows about 0°C. Finish up your sightseeing early on the 5th (Wed) so you can travel to Charleston. Visit Old St. Andrew's Parish Church and Charleston Fire Department, Station 2/3 for their historical value. Your cultural itinerary includes sights like Patriots Point and Fort Sumter National Monument. There's much more to do: take in the dramatic natural features at Angel Oak Tree, take in the local highlights with Walking tours, take in the views from Arthur Ravenel Jr. Bridge, and explore and take pictures at Riley Waterfront Park. For photos, more things to do, ratings, and more tourist information, refer to the Charleston holiday planner . Getting from Washington DC to Charleston by flight takes about 4 hours. Other options: do a combination of train and flight; or drive. Traveling from Washington DC in February, expect Charleston to be a bit warmer, temps between 20°C and 7°C. Finish your sightseeing early on the 8th (Sat) so you can travel to Nashville. Popular historic sites such as Downtown Franklin and Historic Cragfont are in your itinerary. You'll discover tucked-away gems like St. John's Episcopal Church and Wynnewood. Go for a jaunt from Nashville to Franklin to see St. Paul's Episcopal Church about 36 minutes away. And it doesn't end there: take an in-depth tour of Lotz House Museum, take a stroll through Downtown Nashville, see the interesting displays at The Johnny Cash Museum & Cafe, and contemplate the long history of Belle Meade Plantation. For maps, reviews, traveler tips, and more tourist information, refer to the Nashville road trip tool . Traveling by flight from Charleston to Nashville takes 4 hours. Alternatively, you can drive; or take a bus. The time zone difference when traveling from Charleston to Nashville is minus 1 hour. Prepare for a bit cooler weather when traveling from Charleston in February: high temperatures in Nashville hover around 13°C and lows are around 1°C. Finish your sightseeing early on the 11th (Tue) so you can travel to Chicago. On the 12th (Wed), take in the spiritual surroundings of Shrine of the Christ's Passion, then look for gifts at The Little Traveler, and then contemplate in the serene atmosphere at BAPS Shri Swaminarayan Mandir. Get ready for a full day of sightseeing on the 13th (Thu): stroll through Oak Street Beach, take in the exciting artwork at Skokie Northshore Sculpture Park, then steep yourself in history at Baha'i House of Worship, and finally get engrossed in the history at Ukrainian National Museum. To see reviews, ratings, where to stay, and tourist information, use the Chicago attractions app . You can fly from Nashville to Chicago in 4 hours. Alternatively, you can do a combination of flight, bus, and subway; or drive. Prepare for little chillier weather when traveling from Nashville in February: high temperatures in Chicago hover around 2°C and lows are around -7°C. Finish your sightseeing early on the 13th (Thu) to allow enough time to travel to South Padre Island. On the 14th (Fri), take in the waterfront at Queen Isabella State Fishing Pier, then explore the wealth of natural beauty at Palo Alto Battlefield National Historic Site, then meet the residents at South Padre Island Dolphin Research & Sea Life Nature Center, and finally soothe aching muscles at some of the top local wellness centers. Keep things going the next day: stop by Paragraphs on Padre Boulevard, appreciate the extensive heritage of Laguna Madre Nature Trail, and then glide through the air with a parasailing or paragliding tour. For more things to do, where to stay, other places to visit, and other tourist information, read our South Padre Island road trip planner. Getting from Chicago to South Padre Island by flight takes about 7 hours. Other options: do a combination of flight and shuttle; or drive. In February, South Padre Island is much warmer than Chicago - with highs of 22°C and lows of 15°C. Finish your sightseeing early on the 15th (Sat) to allow enough time to drive to Fredericksburg. Start off your visit on the 16th (Sun): look for gifts at Luckenbach Texas General Store, brush up on your knowledge of spirits at Garrison Brothers Distillery, then learn about winemaking at Calais Winery, then learn about winemaking at William Chris Vineyards, and finally pause for some serene contemplation at St. Mary's Catholic Church. Get ready for a full day of sightseeing on the next day: grab your bike and head to Kerrville River Trail, then contemplate in the serene atmosphere at The Coming King Sculpture Prayer Garden, then steep yourself in history at Pioneer Museum Complex, and finally take in the exciting artwork at Agave Gallery Fine Art. For reviews, traveler tips, photos, and tourist information, read our Fredericksburg online driving holiday planner . Traveling by car from South Padre Island to Fredericksburg takes 7 hours. Alternatively, you can take a bus; or do a combination of flight and bus. Traveling from South Padre Island in February, plan for a bit cooler nights in Fredericksburg, with lows around 4°C. Wrap up your sightseeing on the 17th (Mon) to allow time to travel to Schulenburg. Schulenburg is a city in Fayette County, Texas, United States. Kick off your visit on the 18th (Tue): look for gifts at Potter Country Store, get engrossed in the history at Texas Czech Heritage and Cultural Center, and then do a tasting at Whistling Duck Winery. To see photos, traveler tips, and more tourist information, use the Schulenburg online trip planner . Getting from Fredericksburg to Schulenburg by car takes about 3 hours. Traveling from Fredericksburg in February, you can expect nighttime temperatures to be a bit warmer in Schulenburg, with lows of 9°C. Finish your sightseeing early on the 18th (Tue) so you can travel back home.